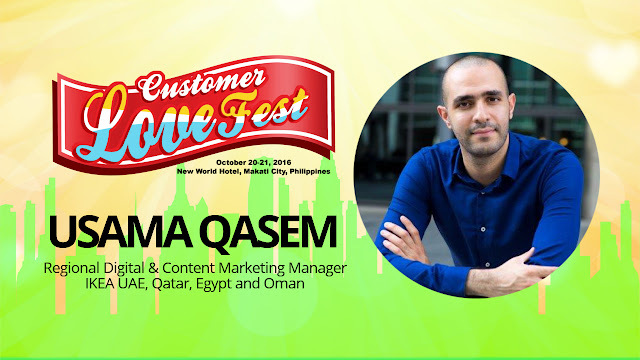 The 2016 Customer Love Fest welcomes IKEA UAE, Qatar, Egypt and Oman Regional Digital & Content Marketing Manager Mr. Usama Qasem. Usama has been working in web and digital marketing for over 10 years. He is one of the pioneers who early advocated for the importance of user experience (UX) and social media in the region. During his career at IKEA he has helped the brand become the first furniture retailer in the Middle East to sell furniture online. In addition, his contribution towards the IKEA website and mobile website has earned the brand 2 awards for enhancement of these digital platforms. He as well launched the brand social media presence in the region. Early in 2015 he founded ESTAND.ME an online shopping website specialized in selling unique and smart products.